A Level 3 / P-4 High Volume Industrial Cross Cut Shredder designed with a special High Torque Low Horsepower Drive Train for standard 115 Volt use without the need for special installation of 220 Volt power. 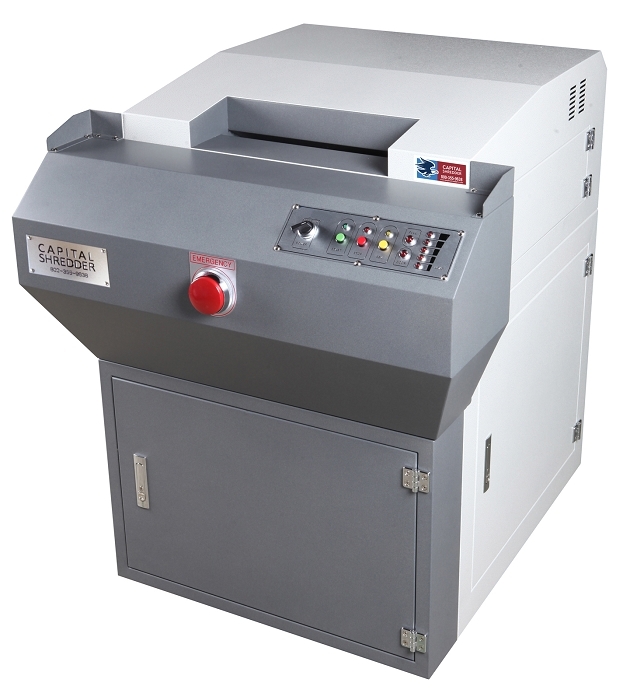 The DL-16XD shredder is built with an Enhanced Cutter Design for long term durability and efficiency and it DOES NOT REQUIRE OIL. Oil Free use is Greener and environmentally cleaner and can result in long term Cost Savings as well. A special Contactless Thermally Protected Motor provides for high performance and low noise operation. With Large Steel Gears and an All Metal Chain Drive the DL-16XD easily handles paper as well as CDs and credit cards. A Load Indicator Display informs the user of the load status during operation. Automatic Reverse Overload Protection prevents jamming. Safety Interlock Switches shut off the shredder when the bag is full or the door is open and a large red Emergency Cut-Off Button enhances safety. Casters allow for easy mobility.